Select the type of comparison. 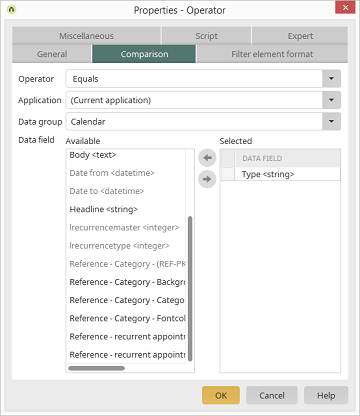 Select the application and data group that contains the data which should be compared with the data of the element to be filtered. Here, the data fields are defined that will be shown in the first drop-down list in the browser. This list displays all of the data fields that can be selected for the filter. This list displays all of the data fields used in the filter. The checkbox next to a data field in this column can be activated, if the option "Show list with data fields" is enabled on the Miscellaneous tab. If the checkbox is active, the data field will be preselected in the browser. Move an entry from one list to the other.